Objective: The objective of the study was to describe our approach and the surgical technique and analyze its safety and the outcome for foramen magnum meningiomas (FMMs). Methods: From 1986 to 2016, 15 FMM patients were operated on using the lateral suboccipital retrocondylar approach. Results: In this series, there were 12 (80%) female and 3 (20%) male patients. The patients ranged in age from 33 to 63 years. There was no operative dead, but two patients died during the follow-up period, which varied from 1 to 24 years (mean, 10.2 years). Twelve patients (80%) achieved Glasgow Outcome Scale 4 or 5. Gross total resection was achieved in 13 (86.6.7%) patients. Conclusions: The majority of FMM can be safely removed using the lateral suboccipital retrocondylar approach without condylar resection, associated to meticulous microsurgical technique. This study included 15 consecutive patients with FMM, histopathological confirmed. The main author (JCL) performed the majority of the surgeries, between January 1986 and January 2015 (29 years), at the Department of Neurosurgery of the Public Servants Hospital, a tertiary referral academic center and Rede Dor/São Luiz hospitals, a private unit at Rio de janeiro, Brazil. The medical charts, pre- and post-operative imaging, and pathological reports were retrospectively reviewed to ascertain the diagnosis of FMM, thereby creating a database from which information pertinent to the present study was collected. Ethical approval was not required for this study in accordance with the institutional guidelines. As this article is a retrospective study, it has inherent biases and drawbacks, and only a prospective study can overcome this weakness. The intraoperative videos and/or photographs of 12 patients were analyzed for nuances of the microsurgical technique. Computed tomography and magnetic resonance imaging scans were reviewed with the radiology department. In this series, two recently introduced innovations were incorporated: Neurophysiological monitoring and neuronavigation. The Glasgow Outcome Scale (GOS) defined the outcome. Control postoperative imaging studies were performed within the first 48 h after surgery to document the extent of resection and postoperative changes. The first clinic visit occurred approximately 15 days after hospital discharge, with subsequent visits at 2 and 6 months. Thereafter, the patients were scheduled for revision at 1-year intervals. They were contacted for imaging studies and clinic visits or interviewed by telephone. The follow-up varied from 1 to 24 years (mean, 10.2 years). The same microsurgery technique for tumor removal was used in the all patients following these initial steps: general anesthesia was induced with a carefully endotracheal intubation. Due to risk of air embolism, a central venous catheter was placed in all patients to allow air aspiration. An arterial line is placed in radial artery. If needed, arterial hypotension (mean arterial pressure around 50 mm Hg) for bleeding controls is obtained. Routine antibiotics, dexamethasone, and mannitol were routinely used. Padded cushions are kept under the areas vulnerable to nerve compression. The patient is secured with large tape in the operating table to allow table rotation to the right or to the left and elevation or depression of the head. These simple maneuvers associated with multiple microscope angulations enhance the exposure, expanding the operative field, and decreasing the size of the bone removal. The patients were positioned on in a semi-sitting position with the head slightly flexed, rotated for the ipsilateral side, and secured in the three-point fixation device. The procedure was initiated with the use of a ×2.5 surgical loupe and coaxial lighting for soft-tissue incision and bone work. A paramedian straight vertical skin incision of 10–12 cm is initiated 3 cm above the level of the superior nuchal line, 3–4 cm medial to the mastoid process, and extended 8 cm inferior to the mastoid tip is carried down through the galea and the periosteum over the occipital bone and then down through the posterior border of the sternocleidomastoid and trapezius muscle, proceeding to the level of C2–C3. The spinous process of the second cervical vertebra is a palpatory guide to the position of the FM and permits the subperiosteal dissection of the suboccipital region to be carried along the posterior arch of C1. The paravertebral muscles are detached from their attachment to the occipital bone and progressively sectioned with scalpel. Self-retain retractors are progressively inserted in the wound, exposing the suboccipital triangle and maintaining the paravertebral muscle in the appropriate position. At this point, the posterior arch of C1 is identified and dissected free with a periosteum elevator until the exposure of the mastoid process. The vertebral artery (VA) is kipped undisturbed in the sulcus arteriosus. The suboccipital craniectomy is created unilaterally, it is extended to the posterior edge of the occipital condyle (OC), but the condyle is preserved. This access provides the sufficient midline and lateral suboccipital exposure to the tumor. The ipsilateral lateral half of the arch of the Atlas More Details is then resected with the Leksell Rongeur. If more exposure is needed, C2 and C3 laminectomy can be included. emissary veins opened during subperiosteally dissection should be bipolar coagulated and waxed immediately. The surgical microscopy is introduced in the operative field and the operation is done with magnification that varies from ˣ 10 to ˣ 16 until the end of the closure. The dura is opened longitudinally, medial from the VA entry. Care must be taken when opening the circular sinus because large venous plexus makes the homeostasis much more difficult and the risk of embolism grows. The dural edges are tented up. The cisterna magna is opened to drain the cerebrospinal fluid (CSF). The tumor is exposed under the arachnoid. The brainstem, low cranial nerves (LCNs), and the VA are identified. The exposure is improved after gentle elevation of the cerebellum with fixed retractors. In the anteriorly placed tumors, the spinal cord was displaced posteriorly and laterally to the opposite side by the tumor. The spinal portion of the accessory, the XI CN, and the posterior rootlets of C2 are identified on the posterior lateral aspect of the meningioma [Figure 2]b. The dentate ligament and C2 rootlets are sectioned whenever necessary, but the vessel traveling along the nerve root should be preserved to avoid spinal cord ischemia. After bipolar coagulation of the tumor capsule with low current under saline irrigation, the tumor is partially desvascularized; the capsule was incised with scalpel, penetrated, and progressively debulked from within, with piecemeal tissue removal techniques. Rigorous homeostasis is maintained throughout the operation. A careful attention was paid to identify and respect the arachnoid plane at the tumor brain stain interface, which facilitates the complete tumor resection and minimizes a small vessel and brain stain injury. Ultrasonic aspirator is used for accelerating the debulking process. The surgery proceeds within the space provided by the tumor growth. The tumor is desvascularized by a progressive coagulating and severing of the meningeal feeders that allow devascularization of the tumor mass reducing the volume and minimizing the brain retraction. The meningioma is then dissected away from the LCNs and the blood vessels by gentle meticulous microsurgical techniques with microscissors and dissectors and multiple microscope angulations, rotation of the operative table, and different magnifications. As tumor debulking proceeds, using a piecemeal removal techniques, the brain stem progressively relaxes and provides additional working space for dissection around the capsule. Then, the site of tumor attachment is identified, coagulated, and sectioned. Most of FMMs arise anterolateral [Figure 1], [Figure 2], [Figure 4] and [Figure 5].,, A gross total resection (GTR) is always attempted, [Figure 1],[Figure 2] and [Figure 4] but if the arachnoidal cleavage plane could not be defined during surgery or if dissection of the tumor from the VA, its branches, the brain stem, or LCNs could entail the risk of damage, we left a thin rim of tumor attached to these structures [Figure 3]. No attempts are made to resect the dura or to excise the involved bone. The dura is closed primary or either with a free pericranial graft. The craniectomy defect is covered with a paste made of bone dust and a few drops of blood and normal saline. All open mastoid cells are sealed with bone wax to prevent CSF leaks. The closure of superficial planes consisted of three layers of suture, with nylon stitches on the skin. If swallow deficits are noted in the postoperative period, an early tracheostomy is performed. There were 12 (80%) females and 3 (20%) male patients, ranging in age from 33 to 63 years (mean, 48.5 years). Headache and/or neck pain were the symptoms in 13 individuals (86.6%). Gait disturbance reported in six patients (40%). Pyramidal syndrome was found in nine patients (60%). LCN dysfunction was diagnosed in eight individuals (53.3%) [Table 1]. The tumor diameter ranged in the large axis from 1.5 to 7.3 cm (mean, 3.8 cm). The pathology, as defined by the WHO classification of meningiomas, was benign in all (100%) cases. Among them, 6 were transitional subtype, 6 showed fibroblastic features, and 3 were meningothelial. We did not find a correlation among the meningioma subtypes and clinical outcome and extension of tumor removal. Twelve (80%) of the tumors were inserted anteriorly or anterolaterally to the dentate ligament and 10 (66.6%) crossed the midline. Surgical outcome, tumor size, histology, location, and follow-up are summarized in [Table 2]. There was no operative mortality in this series (until 30 days after surgery), but two patients (13.3%) died between 60th and 180th day following surgery resulted from aspiration pneumonia and its consequences, due to the aggravation of previous LCNs. Postoperative deficits were observed in 6 (40%) patients, consisting of 9th and 10th in 4, 12th in 1, and 7th in 1 patient, respectively. Three of such patients partially recovered from the LCNs deficits during the follow-up period. One patient presented partial brachial plexus paralysis. Two (13.3%) patients with difficulty in swallowing that needed temporary tracheostomy and tube feeding. Difficulty with dissection of tumor from the brain stem and from encased vessels' due absent arachnoid plane occurred in 12 instances (80%). We obtained Simpson Grade 2 in 13 individuals (86.6%) and Grade 3 in 2 (13.3%) others. In general, 12 patients (86.6%) achieved good or excellent outcome (GOS 4 or 5). There were two patients with postoperative cerebrum spinal fluid (CSF) leakage who returned to the operating room to repair. We observed recurrence of the lesion in 2 (13.3%) patients. One was reoperated 8 years after the original procedure, and the other individuals were treated with adjuvant radiotherapy. The FM comprises a bony channel formed anteriorly by the lower third of the clivus, the anterior arch of the atlas, and the odontoid process. The lateral limits are the jugular tubercle (JT), the OC, and lateral mass of the atlas. Finally, the FM is limited posteriorly by the lower part of the occipital bone, the posterior arch of atlas, and the two first intervertebral spaces. The FM encloses the vertebral arteries (VAs), the anterior and posterior spinal arteries, the IX, X, XI, XII CNS, and the roots of C2.,,,, Based on the insertion of the dura, the FMM can be classified as anterior if they were attached to the anterior rim of the FM and displaced the neuraxis in a posterior direction [Figure 3]a. Anterolateral meningiomas are those situated on the ventrolateral rim of the FM and displaced the neuraxis posterolateral [Figure 3]b. Tumors in both subgroups were located ventral to the dentate ligament. Posterior lesions, if the insertion in the dura, are posterior to the dentate ligament. Most of FMMs arise anterolateral, followed by posterolateral.,,, Twelve (80%) patients in this sample were located in the anterolateral location. Surgery of tumors, located anterior or anterolateral to the brainstem, constitutes a formidable technical challenge to neurosurgeons. The surgical access is often narrow and restricted, with little room for manipulation. A controversial discussion has risen concerning the utility of systematic OC drilling for approaching anterolateral tumors. Sen and Sekhar and a group of surgeons stated that, in anterior or anterolateral located FMMs, the extreme lateral or far-lateral approach associating VA medial transposition with a total or partial condylectomy improves the angle of visualization of the area ventral to the lower brain stem, facilitating the dissection of the interface between the neuraxis and tumor.,,,,, On the other hand, George et al., Bassiouni et al., and others,,,, concluded that, as the tumors progressively displace the medulla and the spinal cord posteriorly, create a space, and trough this space, the tumor can be safely and completely resected through a posterolateral suboccipital craniectomy, without condylar drilling. Most of the cases of incomplete tumor resections are not the result of inadequate exposure, but instead to invasion of the pia mater of the brain stem or the involvement of the VA or cranial nerves by the tumor. In such patients, a subtotal tumor resection is recommended, which leaves a thin rim of tumor.,,,,,, Wanebo and Chicoine concluded that, in patients with a small foramen magnum, with a sort distance between the anterior rim of the FM and brain stem and relatively large OCs, the transcondylar approaches would be helpful. On the contrary, Spektor et al. reported that total resection of the condyle provided a very little additional exposure to anterior FM and do not compensate for the significant level of possible additional morbidity. Concluded that the extensions of bone removal should be adapted to the topography of the lesion: the retrocondylar approach for the lateral area of the FM, the partial transcondylar for the anterolateral portion, and the complete transcondylar for the anterior part to the FM. A recent review found that 657 cases of FMMs from 29 world neurosurgical centers revealed that, in six, they routinely performed condylar resection, in four, they tailored the drilling of the condyle, and in seven other centers, they never resect it. The lateral suboccipital retrocondylar craniectomy with the lateral extension without resection of the OC provided satisfactory exposure in the majority of the patients, because most of these anterior or anterolateral tumors grow predominantly to one side, providing a corridor of exposure without the need of condylar resection. These lesions belong to the group of tumors in which, paradoxically, it is easier to excise a large tumor than small ones, because the larger tumors provide more space anteriorly and thus lessen the need for a more lateral exposure. Extensive drilling of the OC, lateral mass of the atlas, and JT can lead injury to the hypoglossal nerve, VA, and promote spinal instability.,,,,,,,, The bipolar coagulation is kept to a minimal, used with low intensity and under continuous cold saline irrigation; the aspiration is seated in the soft suction mode. Total removal could be dangerous for some patients and difficult to achieve because these tumors are critically located, and there may be adherence or even encasement of vital structures by the tumor. If the surgeon persists with any attempt to remove every last residual lesion to achieve the cure of the patient, it could result in unwarranted lesions or injury in the perforating branches. The main cause of postoperative morbidity is injury to the basilar artery branches. Injury to even a single perforating vessel can result in brainstem infarction. On diagnosis, many lesions are already large or giant. Several authors reported increasing tumor size to portend higher rates of incomplete resection, higher rates of surgical morbidity, and an increased risk of recurrent disease. The decision on the extent of surgical resection can be difficult, particularly in older or in patient with minor symptoms. On the other hand, the experience clearly emphasizes that, when tumors are removed incompletely, they tend to regrow, and the next surgeon operating on the patient will be confronted with severe adhesions of blood vessels and brain tissue. As our objective was always to keep patient's quality of life a priority, so, a subtotal removal might represent a very acceptable goal in fibrous, calcified tumors, encasing the VA, and perforating vessels, adhering to cranial nerves or infiltrating the brain stain.,,, However, even when GTR is performed, tumor recurrence can occur. Radiosurgery might be considered as alternative therapy for residues or recurrences or even in patients deemed poor candidates for resection.,, Future research directions: The role of the endoscopic endonasal approach in the management of ventral posterior fossa meningiomas is still restricted due to limited surgical indications and experience. It can be used for the rare cases of meningiomas with most part of its dural base at the midline clival region. 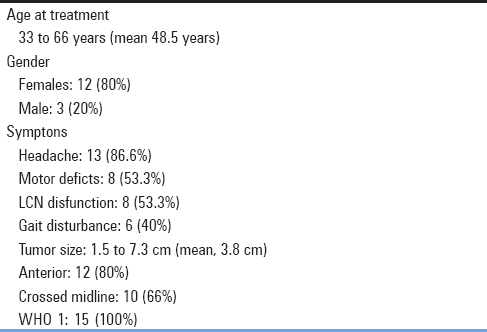 Strengths of the study: Most of this patients were operated on by single senior neurosurgeons that give to this sample homogenous surgical techniques. Limitations: Compared with others published series, this series is relatively small. In most of anterolateral FMM, the retrocondylar approach without drilling the OC to be sufficient for tumor removal. This surgical technique is safe and effective. However, tailoring surgery including drilling of the OC, based on size and shape of FM, and the local of dural origin of the tumors also seems a reasonable option. Cusimano MD, Faress A, Chang Y, Luong W. Foramen magnum meningiomas. In: De Monte F, McDermott MW, Al-Mefty O, editors. Al-Meftys Meningiomas. 2nd ed. New York: Thieme; 2011. p. 297-309. Arnautović KI, Al-Mefty O, Husain M. Ventral foramen magnum meninigiomas. J Neurosurg 2000;92:71-80. Lot G, George B. The extent of drilling in lateral approaches to the cranio-cervical junction area from a series of 125 cases. Acta Neurochir (Wien) 1999;141:111-8. Yasargil MG, Mortara RW, Curcic M. Meningiomas of basal posterior cranial fossa. Adv Tech Stand Neurosurg 1980;7:3-115. Pirotte BJ, Brotchi J, DeWitte O. Management of anterolateral foramen magnum meningiomas: Surgical vs. conservative decision making. Neurosurgery 2010;67:58-70. Bertalanffy H, Gilsbach JM, Mayfrank L, Klein HM, Kawase T, Seeger W, et al. 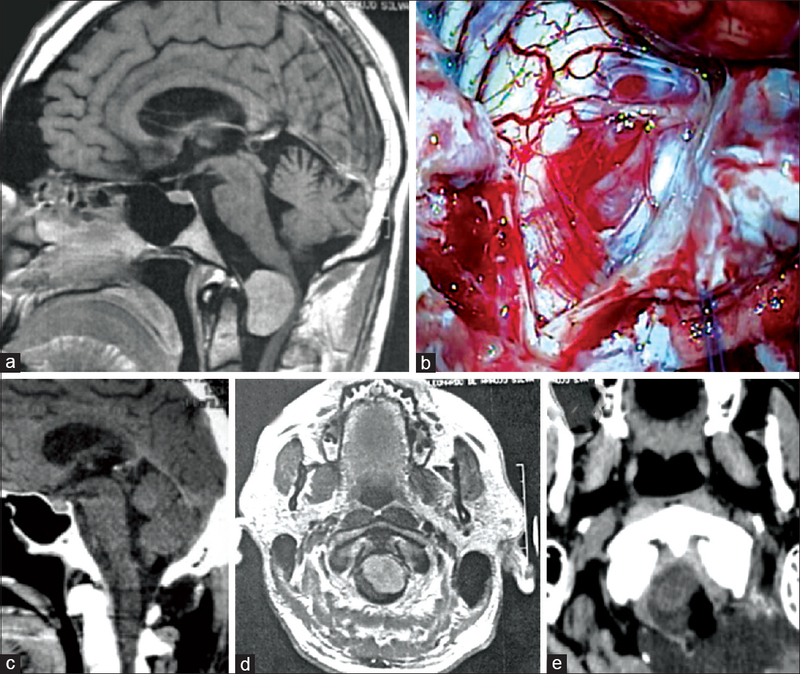 Microsurgical management of ventral and ventrolateral foramen magnum meningiomas. Acta Neurochir Suppl 1996;65:82-5. Sekhar LN, Swamy NK, Jaiswal V, Rubinstein E, Hirsch WE Jr., Wright DC, et al. Surgical excision of meningiomas involving the clivus: Preoperative and intraoperative features as predictors of postoperative functional deterioration. J Neurosurg 1994;81:860-8. Sen CN, Sekhar LN. 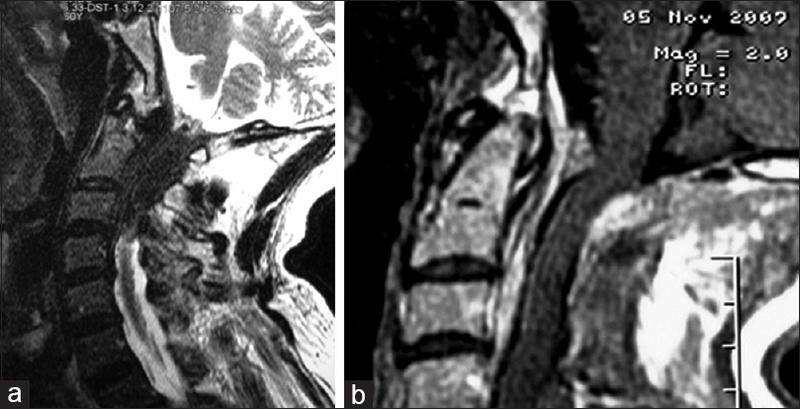 An extreme lateral approach to intradural lesions of the cervical spine and foramen magnum. Neurosurgery 1990;27:197-204.
de Oliveira E, Rhoton AL Jr., Peace D. Microsurgical anatomy of the region of the foramen magnum. Surg Neurol 1985;24:293-352. Pamir MN, Ozduman K. Foramen magnum meningiomas. In: Pamir MN, Black PM, Fahlbusch R, editors. Meningiomas a Comprehensive Text. China: Saunders; 2010. p. 349-54. Margalit NS, Lesser JB, Singer M, Sen C. Lateral approach to anterolateral tumors at the foramen magnum: Factors determining surgical procedure. Neurosurgery 2005;56:324-36. George B, Lot G, Boissonnet H. Meningioma of the foramen magnum: A series of 40 cases. Surg Neurol 1997;47:371-9. Bassiouni H, Ntoukas V, Asgari S, Sandalcioglu EI, Stolke D, Seifert V, et al. 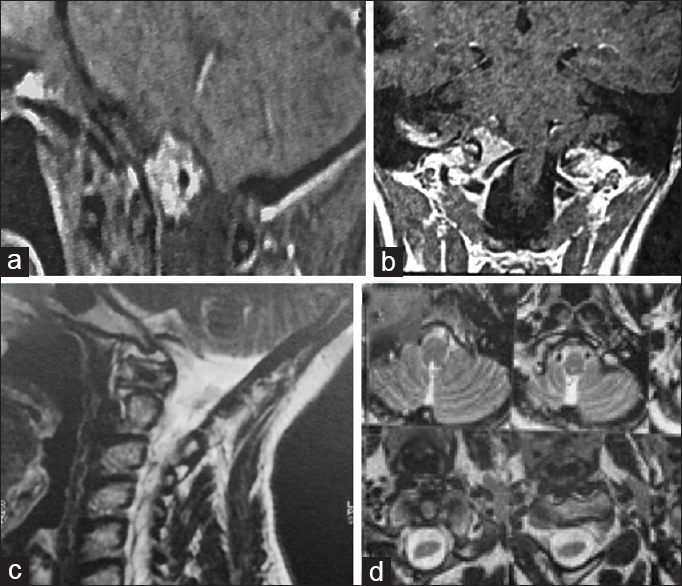 Foramen magnum meningiomas: Clinical outcome after microsurgical resection via a posterolateral suboccipital retrocondylar approach. Neurosurgery 2006;59:1177-85. 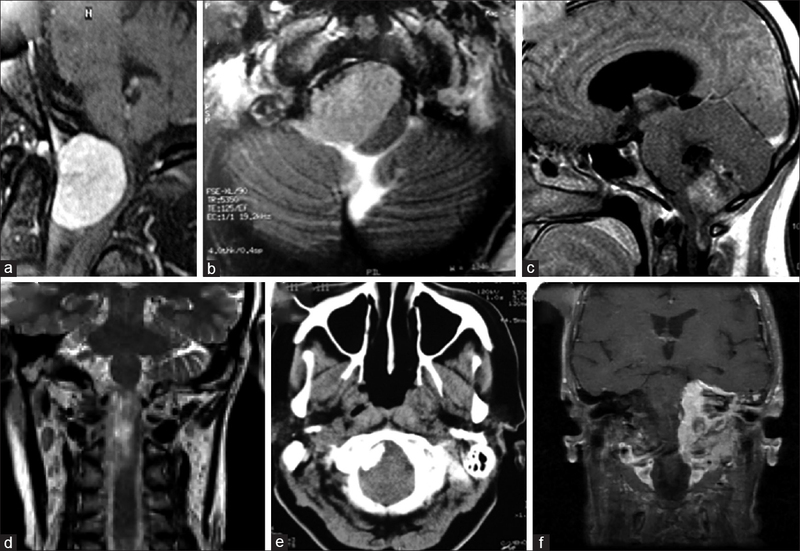 Goel A, Desai K, Muzumdar D. Surgery on anterior foramen magnum meningiomas using a conventional posterior suboccipital approach: A report on an experience with 17 cases. Neurosurgery 2001;49:102-6. Komotar RJ, Zacharia BE, McGovern RA, Sisti MB, Bruce JN, D'Ambrosio AL, et al. Approaches to anterior and anterolateral foramen magnum lesions: A critical review. J Craniovertebr Junction Spine 2010;1:86-99. Babu RP, Sekhar LN, Wright DC. Extreme lateral transcondylar approach: Technical improvements and lessons learned. J Neurosurg 1994;81:49-59. Borba LA, Colli BO. Foramen magno meningiomas. In: Lee JH, editor. Meningiomas. Diagnosis, Treatment and Outcome. London: Springer; 2008. p. 449-56. Erkmen K, Bekelis K, Al-Mefty O. Primary Extramedullary tumors of the Cranial Vertebral Junction. In: Bambakidis NC, Dickman CA, Spetler RF, Sonntag VK, editors. Surgery of the Craniovertebral Junction. 2nd ed. New York: Thieme; 2013. p. 154-69. Samii M, Klekamp J, Carvalho G. Surgical results for meningioma of the cranio-cervical junction. Neurosurgery 1996;39:1086-94. George B, Dematons C, Cophignon J. Lateral approach to the anterior portion of the foramen magnum. Application to surgical removal of 14 benign tumors: Technical note. Surg Neurol 1988;29:484-90. Nanda A, Vincent DA, Vannemreddy PS, Baskaya MK, Chanda A. Far-lateral approach to intradural lesions of the foramen magnum without resection of the occipital condyle. J Neurosurg 2002;96:302-9. Wanebo JE, Chicoine MR. Quantitative analysis of the transcondylar approach to the foramen magnum. Neurosurgery 2001;49:934-41. Spektor S, Anderson GJ, McMenomey SO, Horgan MA, Kellogg JX, Delashaw JB Jr., et al. Quantitative description of the far-lateral transcondylar transtubercular approach to the foramen magnum and clivus. J Neurosurg 2000;92:824-31. Bruneau M, George B. Classification system of foramen magnum meningiomas. J Craniovertebr Junction Spine 2010;1:10-7. Beer-Furlan A, Abi-Hachem R, Jamshidi AO, Carrau RL, Prevedello DM. 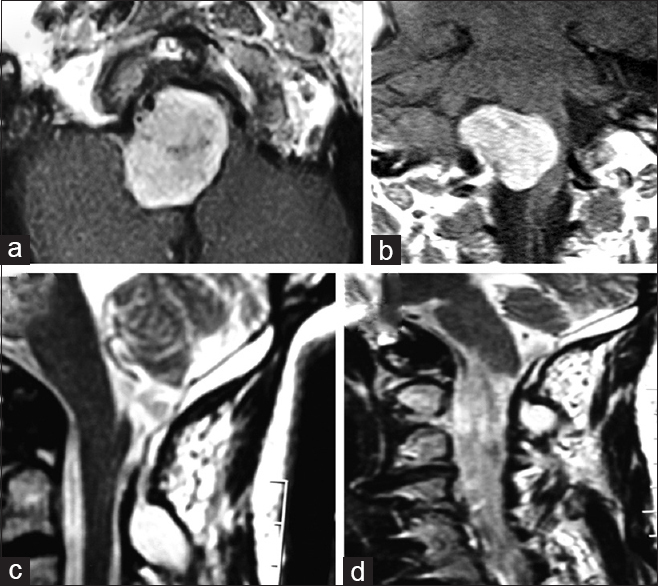 Endoscopic trans-sphenoidal surgery for petroclival and clival meningiomas. J Neurosurg Sci 2016;60:495-502. Muthukumar N, Kondziolka D, Lunsford LD, Flickinger JC. Stereotactic radiosurgery for anterior foramen magnum meningiomas. Surg Neurol 1999;51:268-73. Starke RM, Nguyen JH, Reames DL, Rainey J, Sheehan JP. Gamma knife radiosurgery of meningiomas involving the foramen magnum. J Craniovertebr Junction Spine 2010;1:23-8.